Come to Hamlett's solo show! 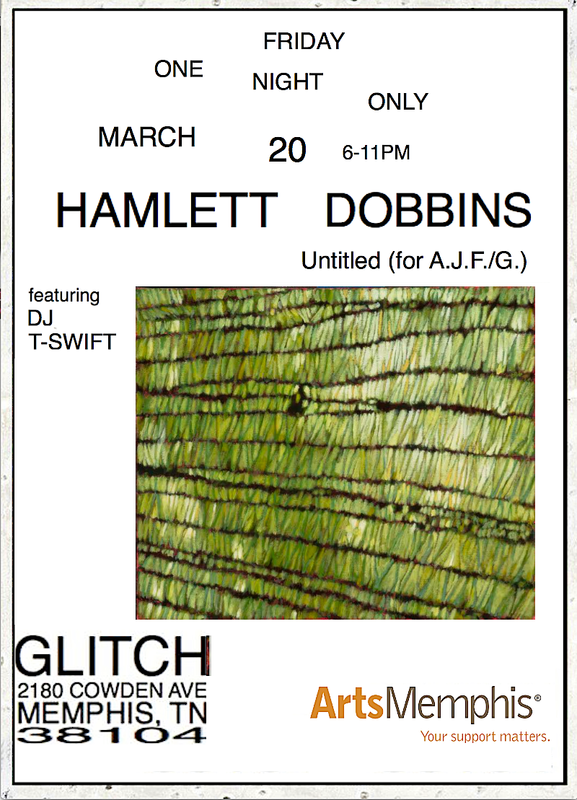 Glitch is beyond excited to have Hamlett Dobbins: Untitled (For A.J.F./G.) at the gallery this month! It's going to be great! The exhibition will open with a reception on Friday, March 20 from 6-11 pm. The show will run through Friday, March 27th. The gallery will be open by appointment only. Appointments can be made by contacting Adam Farmer. For years Dobbins has titled his abstract paintings “Untitled” followed by a series of initials that reference the person about whom the paintings are based. (So, for example, if a painting is based on the experience of having a tea party with his daughter, Milla Rosemary Meiman, then a painting might be named “Untitled (for M.R.M. )”) Since paintings included in the exhibition were made with Glitch’s pattern-filled-space in mind, the show is named for Adam Joe Farmer and Glitch. The suite of roughly a dozen paintings included in the show were made in the time since Dobbins returned to Memphis from his residency at the American Academy in Rome. Dobbins_02.jpg is Untitled (for A.A.R./C.L.N. ), Acrylic on linen on panel, 2014, 17x20”. All images are courtesy the artist and David Lusk Gallery, Memphis. If you should need any additional information please don’t hesitate to contact Adam Farmer at the above information.